In my wildest dreams I never expected that the city really was surrounded, and being reclaimed, by water. Somehow I'd always thought of the descriptions of Venezia as hyperbole. But here we were, in a boat, tooling around the waters of the Adriatic Sea, looking at a delightful mix of architecture, gondolas, and blue skies. The motorboat swings by the Piazza di San Marco (St. Mark's Square); our drop-off point nears. 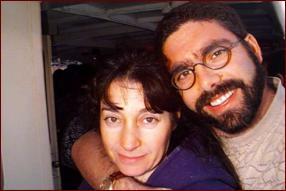 We approach the piers and before long are back on solid ground. What a fun trip. Venice seems to be a clean city, although I can't tell it's because of attentive city sanitation services or whether the tide has flooded the area (as we've been told it does from time to time). 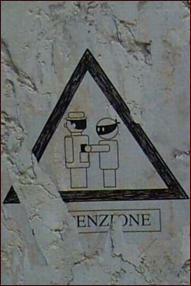 I notice the ATTENZIONE warning picture on the wall; my wallet it zipped in the inner part of my ski jacket - even I have a hard time getting to it. It's a pleasure, living in a place where one never thinks about pickpockets. 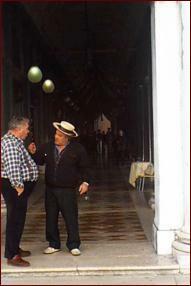 I look around and see several animated conversations, including one involving a man wearing a gondolier's hat. Haggling over a fare, or handicapping the local soccer teams? 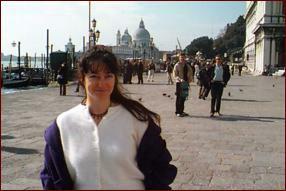 We walk down the waterway, past several tourist kiosks, until we arrive at the Piazza di San Marco. There we turn and face the piazza. Our guide, Anton, was waiting for us. 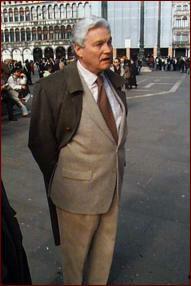 A native Venetian, from a family of Ventians, he eloquently told us of the history and importance of the Ventian state. 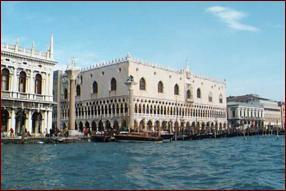 According to tradition, Venice was founded on 25 March 421 A.D., on on March 25, St. Mark's Day. Torcello, where a gorgeous cathedral was built in 639, is the more important village in the lagoon. Government by Doge is established in Venice; the first doge is Orso Ipato, 726. 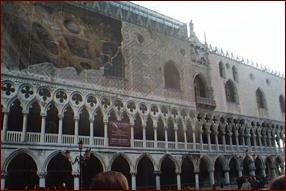 Construction of the Palazzo Ducale (Palace of the Doges) is started in 814 in Piazza di San Marco. The first Basilica was begun in 834, but it burnt down. In 1000 its fleet defeats the pirates of the Adriatic sea. The journeys of Venetian merchant Marco Polo, 1271-1295, from Venice to China must be one of the most fascinating stories of the Middle Ages. His adventures, and his meeting with the Gengis Khan, can be read about in Il Milione. The Black Plague halves the Venetian population in 1348, but the nation-state bests the republics of Amalfi, Genoa, and La Spezia to become the leading sea power of the Mediterranean. In 1489 Venice conquers the island of Cyprus. The world's first Jewish Ghetto was founded in Venezia in 1516. Once a thriving community, now only a few Jews still live here. During the Second World War about two thousand Venetian Jews were deported to Germany; only four survived the Holocaust. The current ghetto contains several synagogues, the Jewish Museum, the Jewish rest-home. Venice is struck by another plague in 1630. Giacomo Casanova is born in Venice in 1725. The Teatro La Fenice, founded in 1790, was destroyed by fire in 1996. The Repubblica Serenissima di Venezia, the Venetian Republic, was defeated by Napoleon in 1797; it becomes part of the Hapsburg Empire, later Austria. Venetians attempt to free their land from the Hapsburg in 1848. Venice joins Italy in 1866.